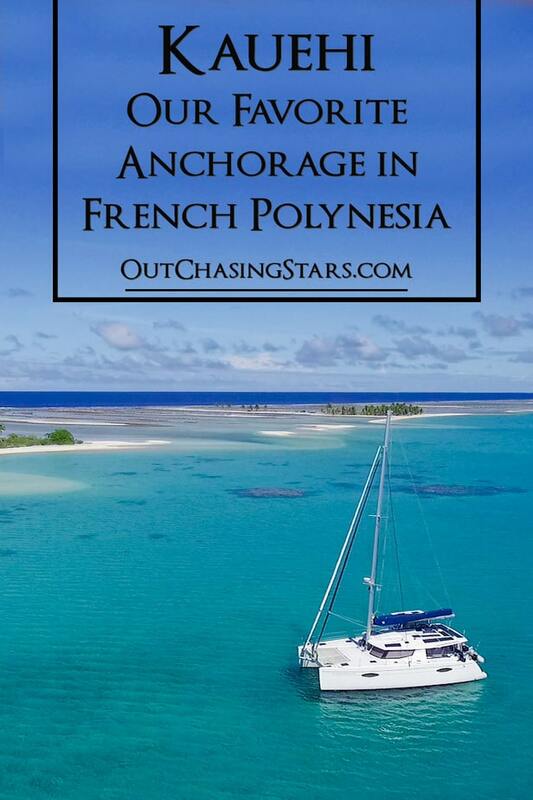 We may have found the perfect anchorage…while cruising Kauehi, a small atoll in the Tuamotus of French Polynesia. Into Kauehi, we went through the pass at almost exactly 11 am. I’m not sure why, but we still had an insane current – 3-4 knots! The water was visually turbulent and it was a little scary to make our way through. SH did just fine though, and we even flew Pheonix next to us and got some stunning videos! We approached the lone village on the northern side of Kauehi and our friends on Cartago hailed us. They were upping anchor and heading to a southern anchorage that we’d read about. It’s remote with clear water and reefs for snorkeling. We decided to change our plans and head over with them. We are more interested in getting good snorkeling in versus visiting a village. We weaved our way through the coral heads, several of which even broke the surface of the water. We dropped anchor in mostly sand and immediately dove in to check our surroundings. There are coral heads around, but our chain was entirely in the sand and our anchor was buried perfectly. Our coordinates are 15 degrees, 56.270 S and 145 degrees 03.364 W.
Cartago arrived shortly afterward, and we have the anchorage all to the two of us. It is truly stunning. The water is so beautiful, and the land of the atolls brings us beautiful white sand beaches and palm trees. It is very much your idyllic tropical paradise. David and I did a quick snorkel down below the boat and near our chain. Our anchor was in the sand at 20 feet, and our chain rested in the sand with just one coral head nearby. SH sat well in 30 feet, with a nearby large coral head 20 feet high (so 10 feet of clearance). On the snorkel, we saw an eel (always a highlight) and some stunning white coral. As Cartago came in we headed back to SH and rinsed off. Once settled, Jose swam by and we chatted and invited them over for happy hour. Jose and Gina brought four coconuts with cocktails in them: coconut water, rum, and pineapple juice. We provided cheese and crackers, and what do you know…insta-party. We discussed snorkeling the next day and had a calm beautiful night at anchor. Our underwater lights had a small school of fish swimming, but nothing else. In the morning, a large dinghy approached Cartago and “kidnapped” them for the morning – Gina was surprising Jose for his birthday with their first ever dive. Pretty awesome girlfriend Jose’s got! After lunch, we chatted and decided to move to the official Southern Anchorage (according to the Tuamotus Compendium). We motored the 1.7 nm and had the anchorage all to ourselves. 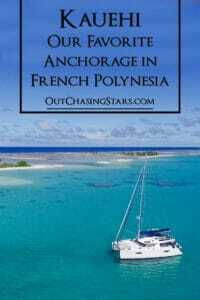 In some cases, an anchorage may be only mediocre, but special circumstances make it extremely memorable for us. For example, Christmas Cove in the USVI is just eh-ok, but will always hold a special place in our hearts because we loved seeing our friends on Let It Be, eating Pizza Pi, and I had an awesome encounter with an octopus. The Southern Anchorage of Kauehi has everything but the wifi. The water was the clearest we have ever seen. We were anchored in about 10 feet of water, and Mac Daddy Mantus was perfectly buried in the sand. There were no coral heads in our swing range. The beach was pink and white sand, full of interesting shells, coconut trees, and hermit crabs. Just a short snorkel to the west lies two large coral heads, about the size of a small cruising boat. The tops are flat just a foot below the water. The reef teems with tiny neon fish, white coral tipped with the purple spark of life, and neon lipped clams. Circling the reef heads are large parrot fish, grouper, and blacktip reef sharks three-to-four feet long. And not having wifi? Well, we have our sat phone and my phone’s been untouched for three days. I’m not too upset about that. Once settled, Jose and Gina came by and we went off snorkeling. We goofed off and checked out the wildlife. 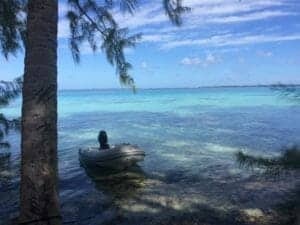 While we swam, another boat anchored nearby – a Lagoon named Rhum Coco. At sunset, Jose and Gina called us to the beach, where we started up a bonfire. The palm fronds were great kindling, and the coconut husks lent a pleasant smell to the beach that kept the bugs away (relatively). Once the fire started to die down though, we caught a few too many bugs, and saw a rat (ek!) Time to go. Heading back to the dinghy I got sidetracked by watching the large nocturnal hermit crabs along the beach. We awoke in the middle of the night to POURING rain. It rained hard for hours, and once it broke, Cartago took off for Fakarava. David and I hopped in LD and headed for the beach. We walked the circumference of the little motu we were anchored behind, stopping to look at shells and check out the small shack. In between the motus, the water runs from the ocean into the lagoon over a very shallow bank. I enjoyed wading in quite a bit. We also noticed that at the mouth of the inlet was a U shaped sand bank, looping from this motu to the next one over. David and I waded along halfway, never getting over our knees. Back on SH David worked on our next video and I read and ran a load of laundry. Two more boats came in: Margansie and Valek, both of who we had seen/talked to before. Throughout the day, we spotted reef sharks in the water around our boat, sometimes as many as 5! Around sunset, I dinghied to say hi to the other boats for some socializing. After dinner, I kept an eye on the underwater lights and was disappointed to not see anything except the bottom. As an alternative, I grabbed David and turned off all the lights. We lay on the trampoline and enjoyed the stars before the moon came up. Just as the moon peaked over the horizon, I was walking back to the cockpit and noticed something odd in the water. At first, I thought it was light reflecting on the water, but then we realized it was bioluminescent life glowing. The large orbs glowed sporadically in the depths of the water under us. It was a lot like the tree scene in Avatar! The next morning (Thursday) woke much brighter than the day before. Margansie was already gone. After breaking fast and applying loads of sunscreen, I went in for a snorkel. I snorkeled the two large coral heads again, and then took off for the smaller coral heads closer into shore. Throughout my snorkel, I was very aware of the sharks around me. At first, it was only one or two, but then I realized four were within sight. Occasionally they got a little closer to me than I felt comfortable but they startled away easily. After a half an hour I swam back to SH and David jumped in to join me. We took off for the smaller coral heads again and with our safety in numbers, I was more comfortable around the sharks. They are obviously curious, and although they are not very big, it’s a little intimidating. I can imagine that if you familiarize yourself with the sharks they all have different markings. I am pretty sure we saw one that was pregnant. Back on SH we dried off and had lunch and then got a call from our friends on Blue Raven: they were headed our way! Once they arrived, they went out for a snorkel. David took the opportunity to get the drone up and then gave me a lesson on how to fly it! It’s my first time using Phoenix, even though we’d had her for four months. I got some pretty good footage of the anchorage here and SH next to BR. After the snorkeling and a walk on the beach, the crew of BR came back for some chatting and we gave them the files of the drone footage. We’ve just had dinner, and tomorrow we will depart in the early morning for Fakarava. Blue Raven is leaving, as well as another boat anchored up in the Kauehi village. Fakarava is one of the larger atolls of the Tuamotus, and there is a village there: Rotoava. 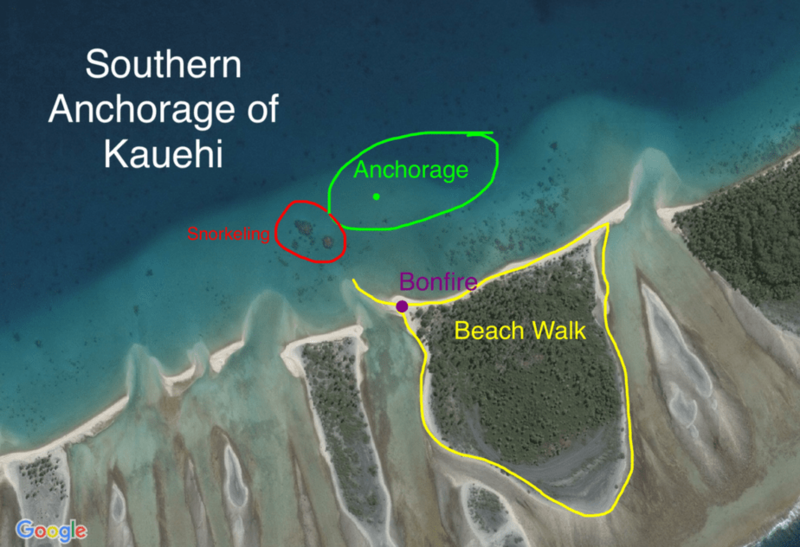 Fakarava is a large atoll – it’s 30 miles from the north pass to the south pass (Tamakohua Pass). We will divide our time between the north pass, the south pass and anchorages in between. We need to leave Fakarava by Friday the 3rd to get to Tahiti on Sunday the 5th. Here’s to more (almost) perfect anchorages. Just don’t let the sharks “taste” you!